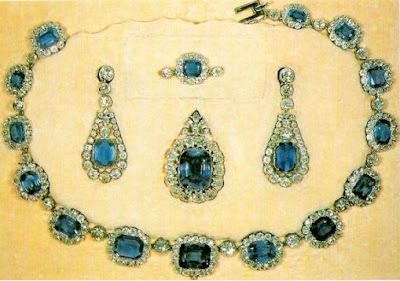 The most luscious set of sapphires at The Queen's disposal also might be the one with the greatest personal significance. King George VI had an eye for sapphires, purchasing them often for his wife. The mid-19th century necklace and earrings he gifted to his eldest daughter for her wedding have to be the most impressive ones he acquired. 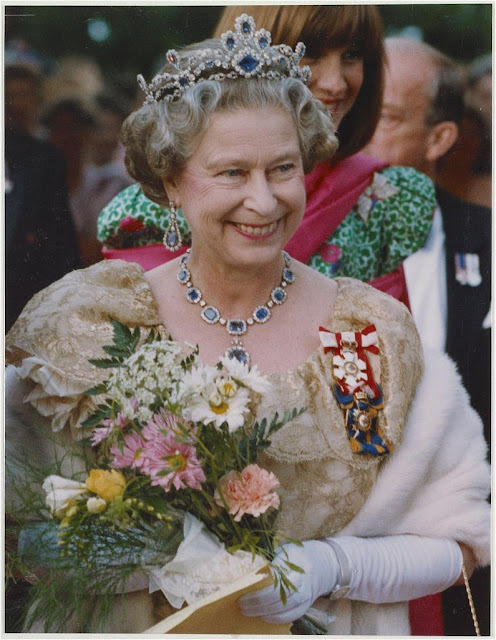 The Queen shortened the necklace, created a pendant for it from one of the extra links, and wore it regularly. She added to the set in 1963, acquiring a tiara and a bracelet. Neither the tiara (which is a converted necklace/dress ornament with a royal history of its own) nor the bracelet are precise matches to the style of the original demi-parure, and yet they make a decent assembled parure. As a personal gift, an example of the jewels that The Queen has added to jewel vault during her reign, and as her largest parure of sapphires, the George VI and Modern Sapphire Set deserves its high place on my list of Her Majesty's top sapphires.